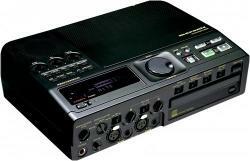 The CDR300 by Marantz Professional is the world's first CD Recording system designed for stand-alone portable recording. 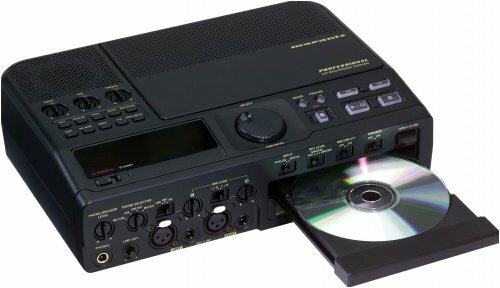 This professional CD recorder offers the functionality of a professional tape recorder, while recording directly to blank CD-R/RW media. Once finalized, recorded discs will play back in virtually any CD player. To record, simply place the compact and lightweight CDR300 on a table-top, plug it into an AC electrical outlet, and record live using either the internal microphone or external microphones that attach to stereo XLR or 1/4-inch mic/line inputs. Because a preamplifier is built into the unit, an external mixer or mic preamp is not required. A built-in speaker or headphone jack conveniently allows recordings to be monitored. "There are many advantages to recording direct to CD-R/RW," says Peter Papageorge, National Sales Manager for Marantz Professional. "The media can be purchased for pennies yet offers superior sound quality compared to cassettes. And most everyone now owns a CD player that can play back CD-R discs." High and low EQ and high and band pass filtering can be independently adjusted for each mic/line input in the preset menu. 48 volt phantom power is available for condenser microphones. The unit also provides manual or automatic level control, limiter, and digital level meters. "We've designed the CDR300 to be as easy to use as our respected line of portable tape recorders. You can start and stop recording just like a tape, and if you use rewritable discs you can even erase the disc or last track," says Papageorge. The CDR300 is a professional-grade CD recorder that records to both music and computer CD-R and CD-RW discs. Track titles can be input using CD-Text. It can make a perfect digital copy of any CD. The unit can also record a CD from any digital or analog source including LPs, DATs, cassettes, or MiniDiscs. RCA analog inputs/outputs and digital (SPDIF) input/output are provided on the rear panel. A 4-pin DC power input enables the CDR300 to be used with external gel-cell battery packs.